That forced me into filing a Freedom of Information Act Request with the FCC in July, 2007, to discover how many petitions to deny licenses have been filed in recent years, and to discover when the last petition to remove a license was successful. The FCC never answered (They are required by law to respond within 20 business days.) Four months later, I complained about it in person to the FCC Commissioners at a formal hearing in Seattle, Washington, and handed a copy to the FCC personnel attending the hearing. Still no reply. But after one public showing of Broadcast Blues in Sacramento, the public rose up with letters to the FCC, asking why citizens have to sue the government to make it do its job. The FCC responded that they had never received a FOIA request from me. Unfortunately for them, I had sent the request via certified mail to two members of the FCC, and had signatures to prove it. Now the FCC is apologizing, and asking that I resubmit the FOIA request. I have done so. How long will it take to get the information? I am not holding my breath. The FCC finally did respond to me in writing. It turns out their rep was correct: The FCC has no records of how many station licenses are currently being challenged, nor do they have records of the last time a license was taken away. Denying stations' licenses to broadcast is the next battleground. 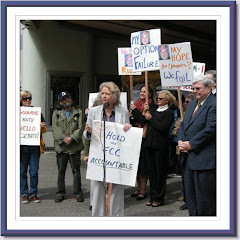 See the story, "A Funny Thing Happened at the Stanford FCC Hearing."